Parties - Birthday, Christening, Engagement, Wedding Reception, Anniversaries, Retirement or anything in between! 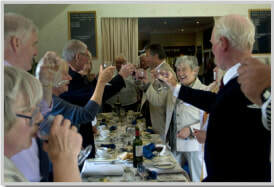 Clubhouse hire for parties and events is free to members and also to charities. For non-members a returnable deposit is required to confirm booking. Non-member hire for meetings or training etc and is competively priced and represent great value. To check out the current tariff and booking process click here. Catering can be provided on request by our resident Caterer, there is also a large dance floor and an enclosed balcony which is an ideal area for laying out a buffet, making Cambusdoon Sports Club perfect for your celebrations. To enquire about facilities or to book a function then best to call the Clubhouse Team on 01292 442885 and they will work with you to answer your queries, confirm the booking and tailor the event to meet your needs. They will also ensure that your event goes smoothly on the day. The catering team is ably led by Rhona Merli. ​Rhona will work with you to provide a customised solution for your event whether it be a sit down set meal or a hot or cold buffet or anything else in between.